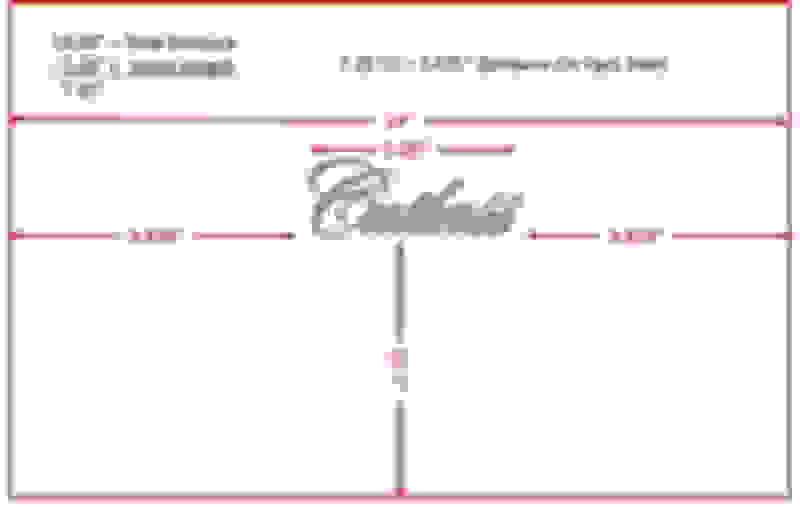 Does the body service manual or chassis service manual show the measurements for the proper placement of the fender scripts on a 72 Supreme? 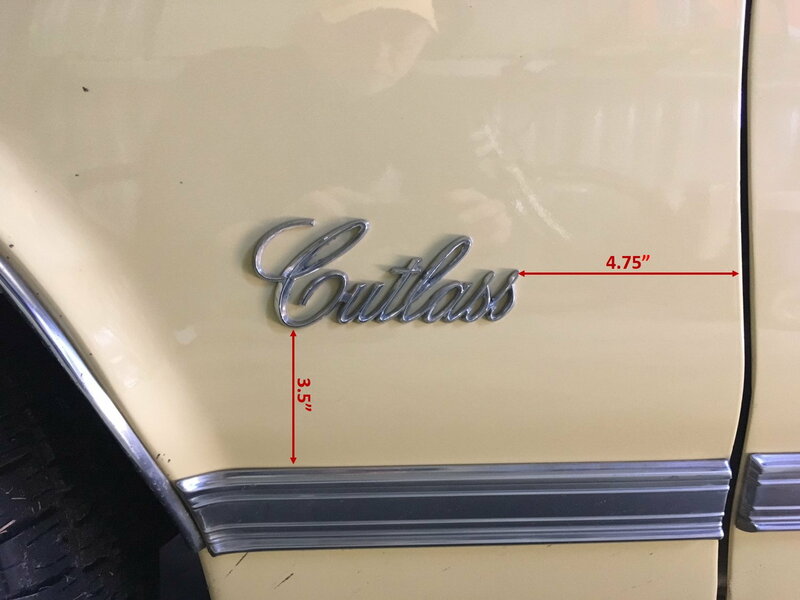 You're thinking of the piercings on the sheet metal for the Cutlass Script? The best you can get is the section from the 72 Assembly Manual. Do you have one? EDIT: Dave the same information is on page 11-19 of your CSM. It doesn't give exact measures though. 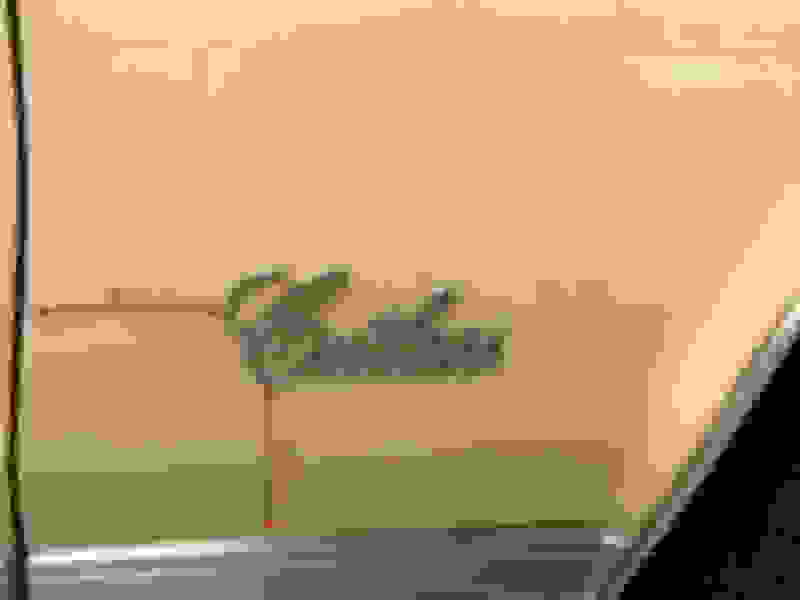 Maybe Chief could help you with this because his car will have the exact same script and location as yours. Last edited by Allan R; January 17th, 2019 at 04:15 PM. I'm not actually gonna punch holes in the fender. I'm planning on getting a set of aftermarket scripts and cutting the posts off, then using 3M tape to mount them, so I need the measurements for where the scripts would be. I'll get you some measurements. 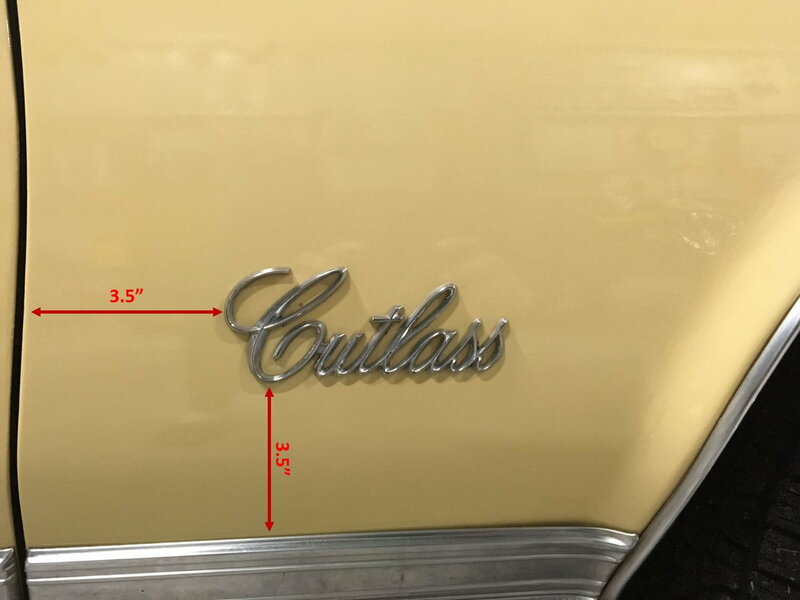 From the edge of the door - where the 1/4 panel meets the door - to the top of the letter 'C' in 'Cutlass' - the distance is exactly 3.5"
From the top of the chrome body side molding, to the lowest portion of the word 'Cutlass' - the distance is exactly 3.5"
Last edited by Vintage Chief; January 17th, 2019 at 08:49 PM. 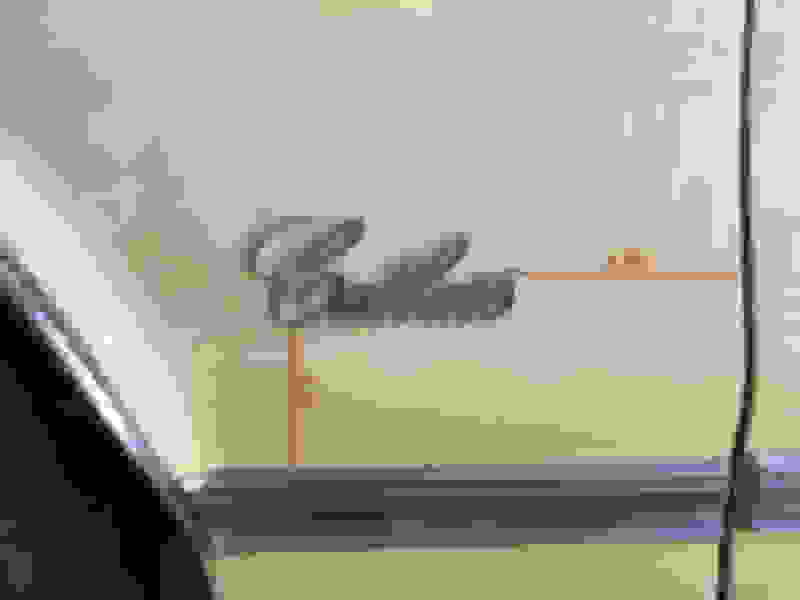 Thx Chief...I don't have the side molding, so what would be the measurement from the bottom of the fender? Dave, you have the rocker panel molding on your car, so be sure to measure from the bottom of that. I'm sure you likely realized that but just making sure. Great measurements Chief. BTW Dave, if you ever did pierce the car for those NOS emblems you would have to also undo the inner fenders to get the speed nuts on the back of the posts. I also have some NOS emblems but I might just sell them as I don't think I'll ever put them on my car. I have waaay too many accumulated NOS and NORS parts in the shed I'll never likely use. ??? I don't think so. 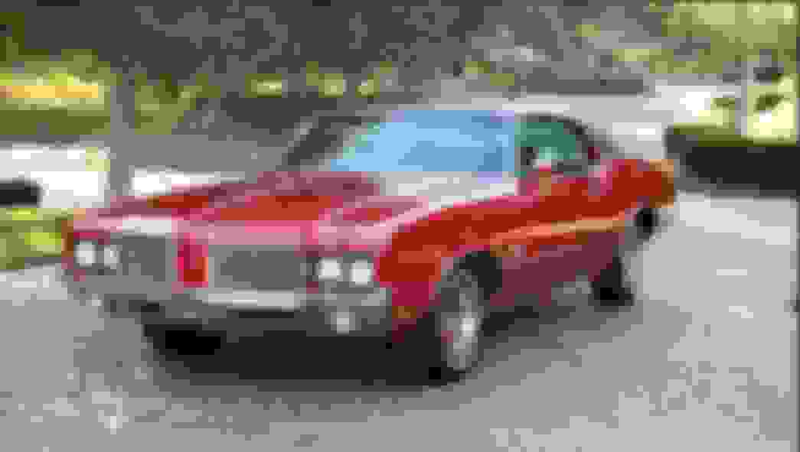 Every 72 Cutlass Supreme came with rocker stainless. Check the bottom of your car. It should have this trim. Listen, if Allan says you have rocker panel molding; then, by jiminy you have it! Since you've stated in previous threads your vehicle was at some previous point in time lighting up the speedway tracks, it's natural for a previous owner to have removed the BSM. Well it appears you don't, although from the factory it did. Lots of mods done to that car of yors. Anywho, that's another thing you need to look for in the restoration process. Important note: only the rocker stainless for the 72 A body coupes will fit. The sedan stainless is much too long. I apologize for my error on your car. The sad thing IMO is that although the missing stainless would be otherwise ideal for a CS vert or lower Cutlass model to clone into a 442, your car could never be one since the 442 option was never offered on teh CS HT. What a shame too since it's a U code car. Last edited by Vintage Chief; January 22nd, 2019 at 07:08 AM. Hahahaha I just got in from washing the Malibu. It's a balmy 15 here and when I go early in the morning there's virtually no one there so I can take as much time as I want to wash and then dry it off. 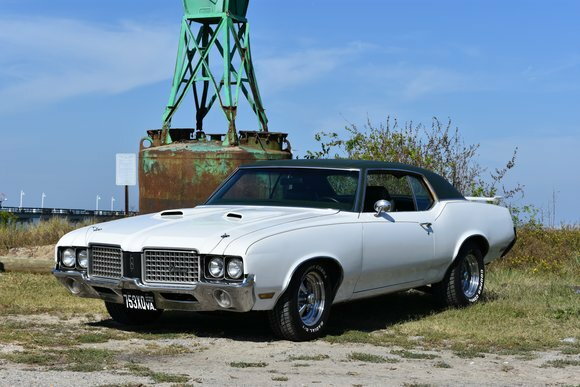 Don't get me wrong, i'd never take my Cutlass out in weather like this. BTW, what shall I call you since you know Dave and my names? 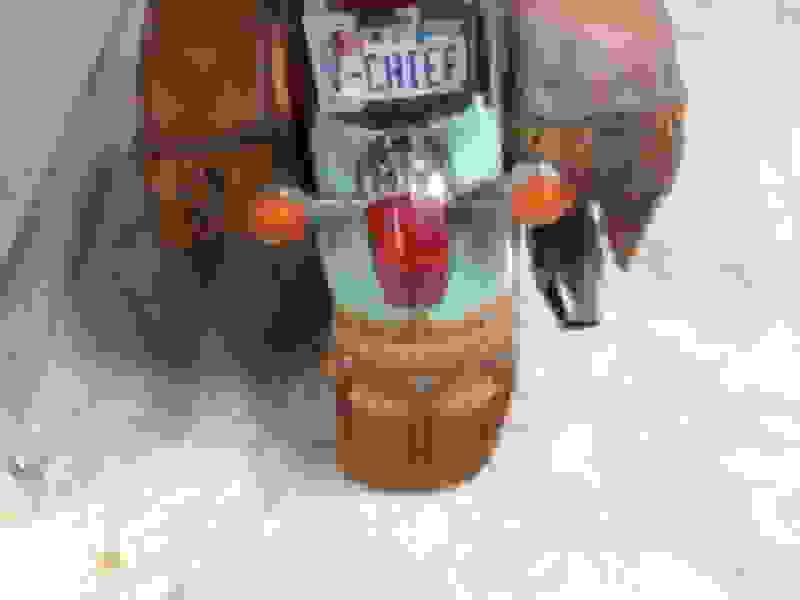 Chief seems soooo 'screenish'. BTW, what shall I call you since you know Dave and my names? Good point. I'll see where to configure my 'signature' and update with a name. 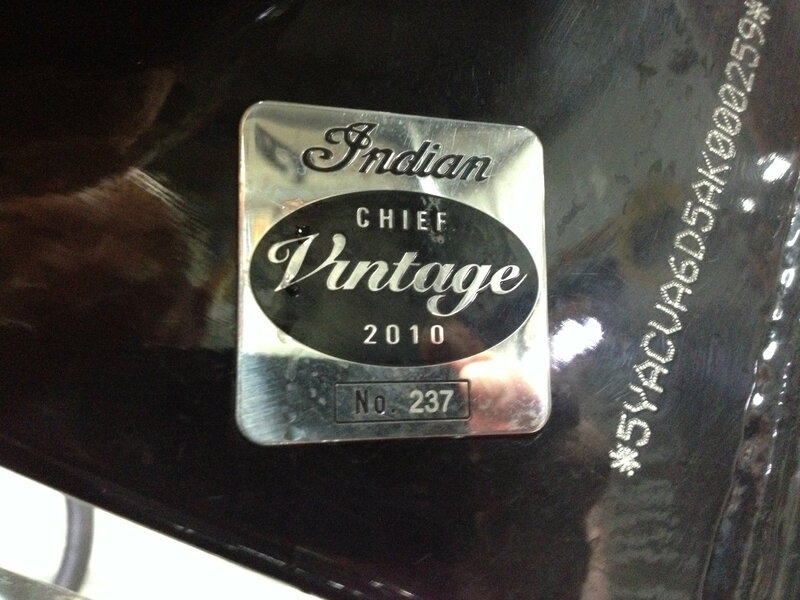 The Vintage Chief moniker you most likely determined relates to my Indian Chief Vintage motorcycle. Very cool bike Norm. I've never seen one decked out quite like that. I'll bet it turns lots of heads when it's on the road. 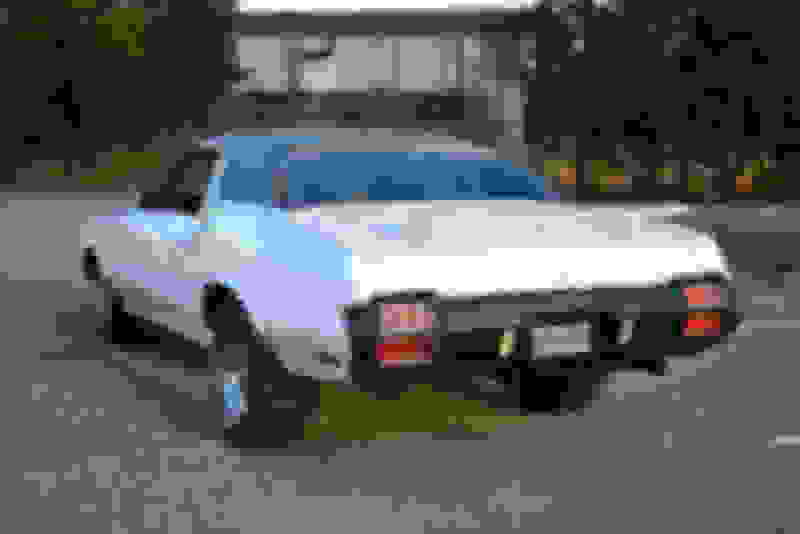 Did you restore it or buy it like that? Sometimes a nuisance when riding, filling up the fuel tank, etc. Plan on spending an additional 15'-30' each time I get on/off w/ conversations from the gawkers. I could tell you stories which boggle my imagination. None-the-less, it's actually a 2010, built in Kings Mountain, NC prior to Indian Motorcycle's purchase by Polaris Industries. 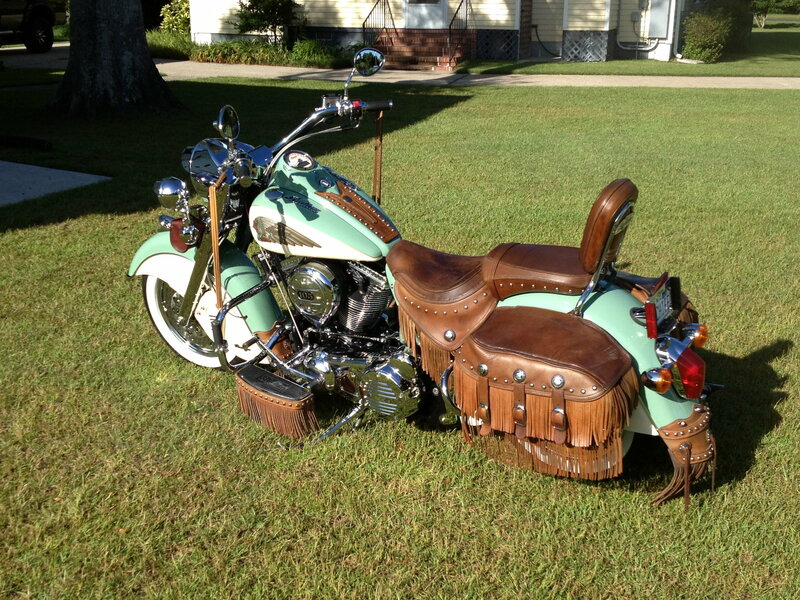 It is designed after the (primarily) 1953 Indian Chief motorcycle. 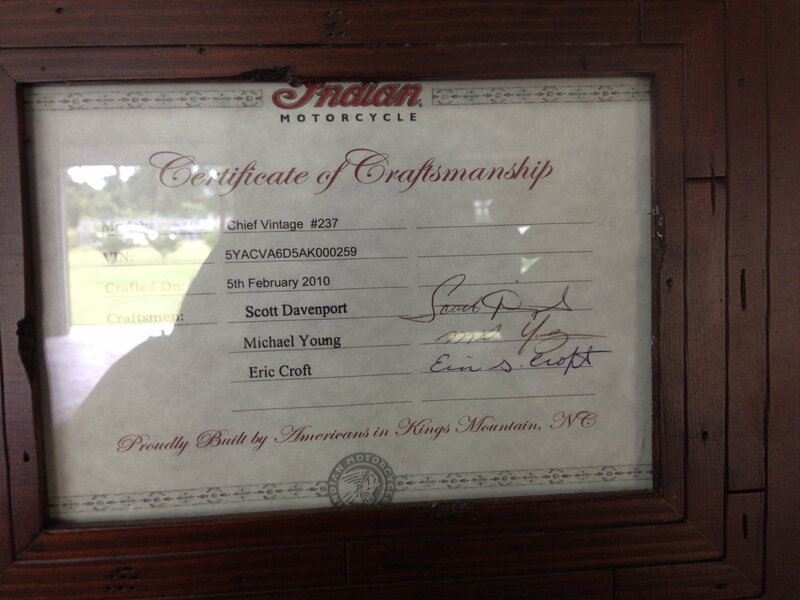 I purchased new for far and above too much money (I had just retired - I wanted an Indian, I had the $$ can't take it with you - I bought it) @ dealership (Indian Motorcycle Charlotte). 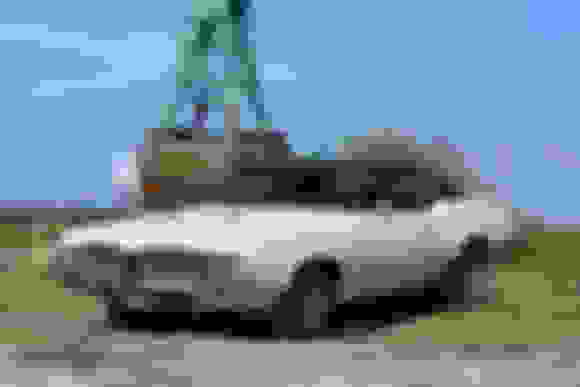 Now has 60K miles with trips to Canada, West Coast (N.A. ), Southern Coast, and many various trips elsewhere. It's a pleasure to enjoy. Like many things, you need to be vigilant on maintenance. Motorcycle ownership is not for those afraid to turn a wrench. I've owned maybe a dozen motorcycles in my lifetime. It was the top-of-the-line model. I have updated many appointments. Thanks jc. I did not say it was a "vintage' motorcycle. 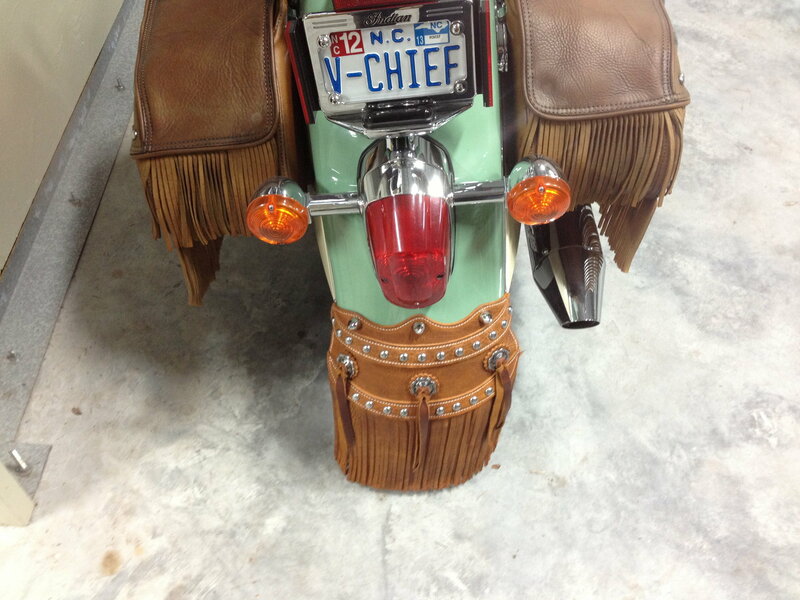 I stated it was a Indian Chief Vintage motorcycle. That is the EXACT description by model and name. i guess if they say it ,it must be true.i wasn't aware they had a model designation named that.i 've been having trouble paying attention to the remake of the indian.you know how old farts get.yours is a great looking machine tho. btw,riding a shovelhead can be a nuisance too.i swear i see more panheads. 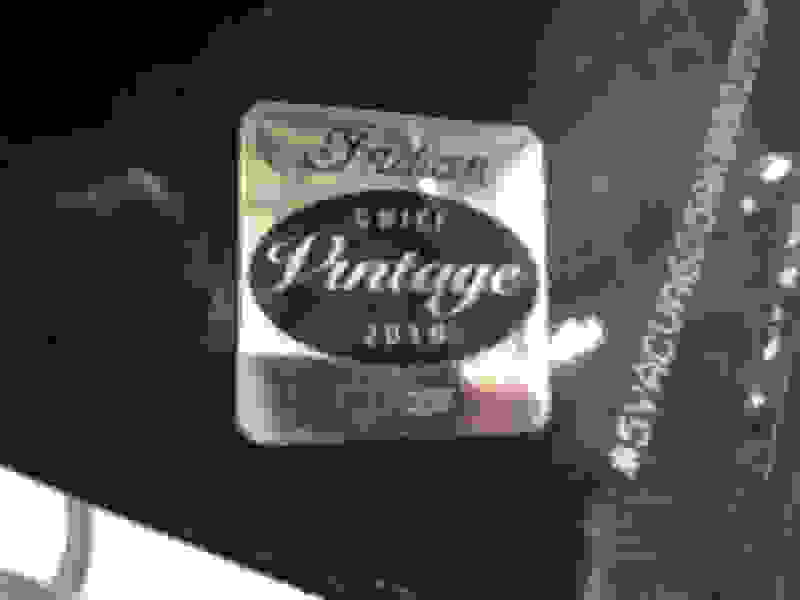 Last edited by Vintage Chief; January 22nd, 2019 at 03:18 PM. i have never owned an Indian motocycle but i have a great respect and love for them,you well know they were built in mass,less than an hour from me and i had visited the original plant and subsequent museum many,many times.the museum now is part of a collection of products made in springfield ,mass.it's quite nice because it's larger,the previous location had to rotate objects because there wasn't enough space.good luck with your "vintage" indian.nice hairdo btw. Dave- You asked for the measurements on the driver's side. 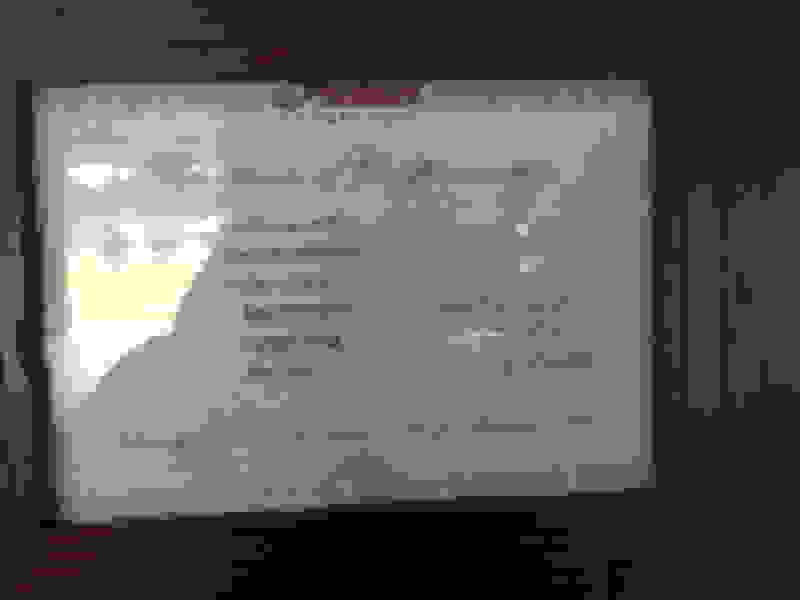 IMO, one of the sides' measurements (probably passenger's side) I provided to you is incorrect - again, IMO. Since I did not perform or have performed the paint job on this vehicle (which is not the original color) I am suspicious one of the sides (driver's or passenger's) is incorrect. I'll let you be the judge. Examine closely. Driver's side is 3.5" from the door/body panel seem (driver's side); passenger's side is 4.5" from the door/body panel seem. The driver's side looks 'centered', IMO. The passenger's side does not appear centered. I have absolutely no clue whether the PO used the original body panel holes for the insignias. unfortunately it seems to happen a lot, to other threads as well. I had one thread that got hijacked at least 20 times during its run. I know what it feels like. Just as an observation I would be careful if you have to drill the script holes. It appears the back of those fenders have been re worked. The back of the fender where the script goes looks to be flattened out a bit right in the area the script goes. So if its been reworked and there is filler there be careful . If you push too hard the filler will crack . Would I center them from the inner edge of the wheel well trim or the outer edge where the trim meets the body? 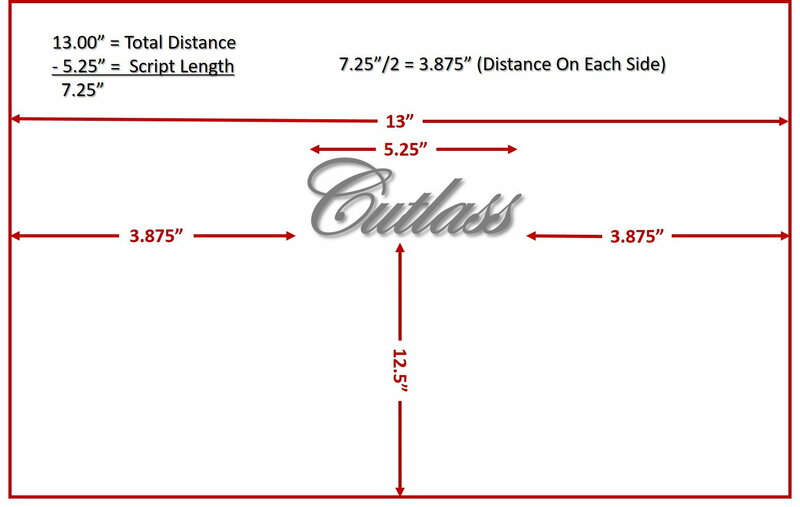 The bottom of the fender to the bottom of the Cutlass script = 12.5"
Length of the Cutlass script = 5.25"
Distance between Door Edge and edge of fender Wheel Well opening = 13"
All times are GMT -7. The time now is 12:27 PM.